When considering your next romantic weekend getaway: Do you need to visit the Lou? Romantic getaways among the vines are a must for any couple. Booze and long-term relationships go hand-in-hand. As she dreamily gazes into your eyes, you become more like Andrew Symonds and less like John Symond with each mouthful of lusty red. So why not pop to the Lou? Perched on a gentle grassy slope, The Louise, one of the Small Luxury Hotels of the World, offers you a luxury escape with cleverly designed terraces and roomy ensuites. Nestled in a tapestry of neverending fields of lush vines and undulating meadows, The Louise is a five star vineyard retreat where privacy is assured and service not a chore but a religion. 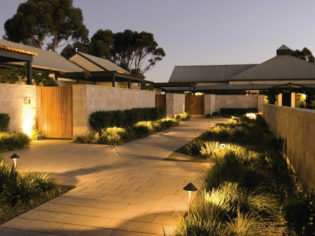 One of the selling points of The Louise is Appellation, the stunning restaurant that offers guests casual elegant dining (as opposed to formal slobby dining) and seasonal cuisine with an extensive wine list, featuring the pick of the Barossa Valley drops and iconic wines from around the world. “Appellation” simply means (I had to look it up too) a place where wine from a certain district can be legally sold. “Pub” would seem easier to spell – and less phonetically like Appall-ation. However, the restaurant, under the gastronomic leadership of über-chef Mark McNamara, is a reason to visit unto itself. Although is it just me or is this whole celebrity chef thing out of control? Who’s next? Plumbers? Fitters and turners? With more than 100 wineries in the area, the Barossa is one of the world’s great wine producing regions with loads of places to visit and warm, fuzzy romantic-type activities for you both. At The Louise, one of these is cycling. However, there are only four bikes so you may have to spike some drinks to secure your wheels for the day. If you’re like me, you’ll look fat and stupid on a bike anyway. There’s a pool and spa and you can order cocktails and sip them on the verandah overlooking vineyards and imbibe the setting sun. Or take an outdoor shower. If you like the sky, Balloon Adventures offer a romantic Champers and Sunrise experience but, after a few big feeds at Appellation, they might find it hard to get the balloon off the ground. Could prove embarrassing. Another fun idea is the Penfolds Most Brilliant Blend Tour. You’ll explore the cellars and barrel halls with a wine expert, then slip on the lab coat and bottle your own brew, before taking it back to the restaurant where said über-chef will create a special course in your degustation meal paired to your wine. (So, if it’s a dud blend, your part of the meal is last night’s Chinese.) You’ll be presented with a bottle with your name on the label as “winemaker” as a keepsake or to give to relatives you hate at Christmas. So, if your relationship is due for some maintenance, why not spoil her at the Lou for the weekend? Where: In the Barossa Valley about an hour’s nag from Adelaide on Seppeltsfield Road, Marananga SA. Price: From $499 (vineyard suite) to $742 (stonewall suite) per couple per weekend includes breakfast and three-course meal at Appellation (booze you pay for). New Greenock and Seppeltsfield Suites have also been added as of September ’08, and all accommodation bookings include gourmet continental breakfast served in-suite at guest’s requested time each morning. *He’s given up the smokes.